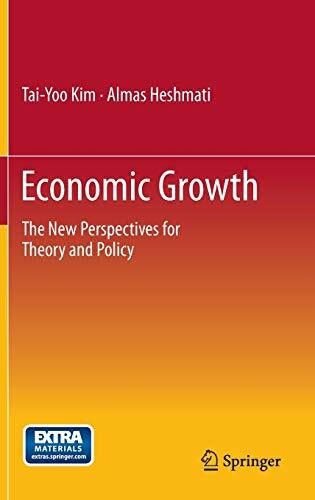 This book shows that the existing theories on economic growth have clear limitations in terms of how much they can effectively contribute to actual economic growth. Therefore, this book presents a more effective theory on economic growth for countries and leaders looking to promote economic growth. It is essentially centered around the theory of economic growth and theory of national development, written for agricultural developing countries pursuing industrialization and late-starting industrialized countries pursuing their own development. Nevertheless, it also makes a significant contribution to the very development of human civilization through the growth of developing countries, late-starting industrialized countries and early industrialized countries throughout the world. Tai-Yoo Kim is a Professor of Economics at the Department of Industrial Engineering, Seoul National University, Republic of Korea. He received his Ph. D. in Economics from Colorado School of Mines; his M. A. from West Virginia University; and his B. E. in Mineral and Petroleum Engineering from Seoul National University. He was a post-doctoral research fellow at Columbia University, after which he became an Assistant Professor at IONA College in New York. He also served in the office of the President of the Republic of Korea as an Advisor in Information, Science and Technology. While natural resources economics is his major academic background, Kim's research interests include energy and resources, information and high technology industry, and industrial policy. His most recent publications focus on the economic growth theory, which he validates through skillful analyses of European history and the transmission of hegemony. Currently, Tai-Yoo Kim is investigating government policies that would promote a shared economic growth, to foster a peaceful and prosperous global economy in the future. Almas Heshmati is Professor of Economics at Department of Economics, Sogang University. He held similar positions at Korea University, Seoul National University, University of Kurdistan Hawler, RATIO Institute (Sweden) and MTT Agrifood Research (Finland). He was Research Fellow at the World Institute for Development Economics Research (WIDER), The United Nations University during 2001-2004. From 1998 until 2001, he was an Associate Professor of Economics at the Stockholm School of Economics. He has a Ph.D. degree from the University of Gothenburg (1994), where he held a Senior Researcher position until 1998. His research interests include applied microeconomics, globalization, development strategy, efficiency, productivity and growth with application to manufacturing and services. In addition to more than 100 scientific journal articles he has published 16 books on EU Lisbon Process, Global Inequality, East Asian Manufacturing, Chinese Economy, Technology Transfer, Information Technology, Water Resources, Power Generation, Landmines and Development Economics.